How do you raise awareness for the tools you provide to parents in order to help them choose the right games for kids? Get Penny Arcade involved. The Entertainment Software Ratings Board constantly works to make parents aware of how its rating system works. However, Penny Arcade is joining forces with the ESRB as part of a new PSA campaign, complete with original artwork. 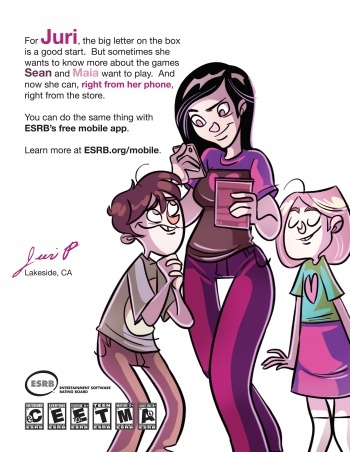 The campaign is intended for both print and online media outlets, will include "caricatures based upon real parents and gamers," and will communicate their own stories about how they've used the ESRB tools like the organization's ratings system and mobile app. Accordingly, these ads will start appearing in "parent focused and game enthusiast media outlets" across the United States, starting this Spring. Of course, this isn't the first time Penny Arcade has worked with the ESRB. In 2006, the creators of the webcomic created a similar series of PSAs. The stars of the ESRB PSA campaign include Juri Peterson, a Navy wife and mother of two teens from Lakeside, CA. ; Richard Hosler, a married father of one from Lafayette, IN; and Joshua Conway, a gamer from Los Angeles, CA. The ESRB is also planning to co-host a "Twitter Party" on February 23d at 9 PM EST. The party will also be co-hosted by Johner Riehl of Family Friendly Video Games and Mary Heston of WiredMoms to talk about how the ESRB's tools can be used to choose the right games for kids. You can join the conversation by RSVPing on Facebook and then using the #ESRB hashtag on Twitter.